Whole body health restoration is the key to this starter package. While the primary pain complaint or injury will be the center of attention, balancing the rest of the muscular system and nurturing the health of your immune system will support the lasting results you are searching for. While you recovered from your latest ankle injury, did you notice that one of your shoulders is higher than the other? Treating your injured ankle and leaving your shoulders imbalanced would be the same as replacing only the heavily-worn right front tire, ignoring the left front tire, and not getting the car’s alignment corrected. As your nerve roots are reset from head to toe, structural alignment is restored and muscles engage more efficiently and become stronger. The efficient use of muscles translates into more physical and mental energy for all of your activities. Your muscles are no longer working twice as hard to complete the basic movements. Learn more about resetting nerve roots. … more physical and mental energy for all of your activities. Your muscles are no longer working twice as hard to complete basic movements. The body can be gently encouraged to naturally drain its lymph through lymphatic drainage techniques. These techniques support removal of toxins, decreases pain, and supports the immune system. Learn more about the lymphatic system. 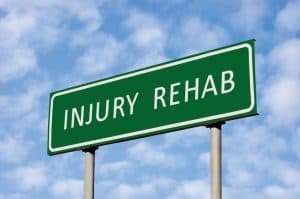 How are the injury rehabilitation treatments scheduled? The schedule is five treatments within eight days, starting with three consecutive daily treatments, then a day off, followed by the fourth treatment, then two days off, followed by the fifth treatment. Each person’s nervous system has a different response time. The suggested Injury Rehabilitation schedule is effective for 85% of clients. For clients requiring more time for their nervous system to reorganize, 6-8 sessions over a two-week period may be necessary. It is recommended that the Maintenance Package immediately follow the Injury Rehabilitation Package.